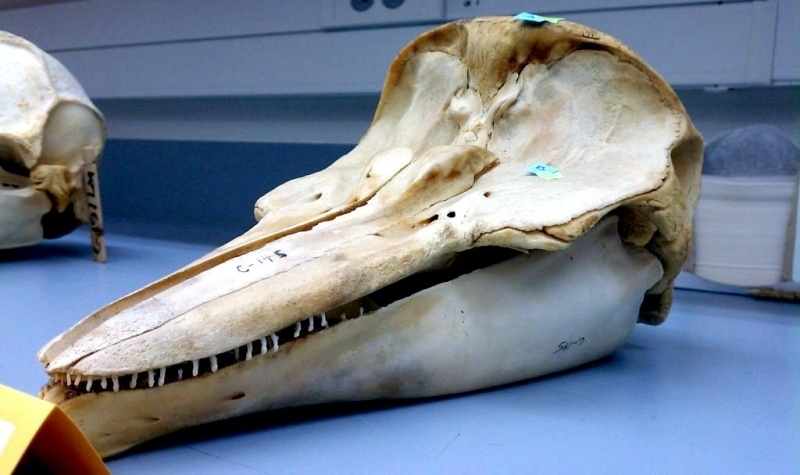 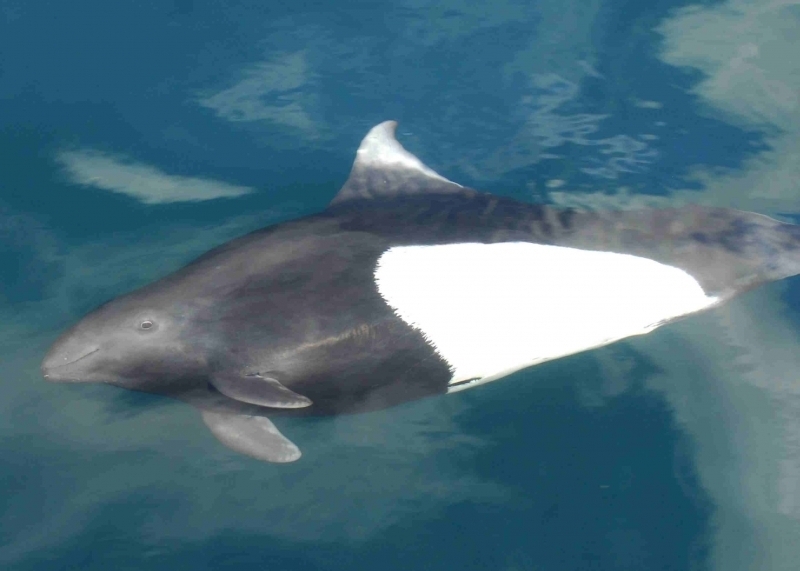 Dall’s Porpoises are robust & muscular cetaceans with relatively small heads that slope steeply to short indistinct beaks and were named after American naturalist William H. Dall. 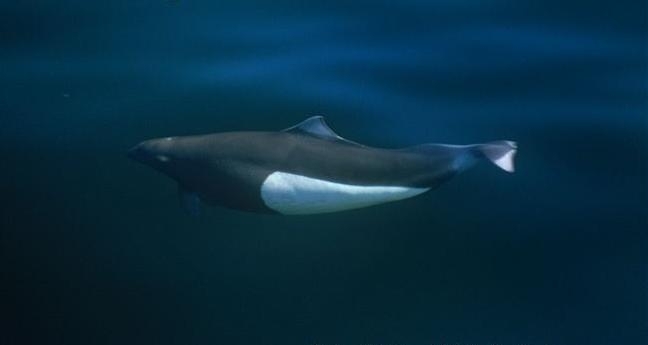 In spite of their stocky body, they are a relatively small porpoise that average only 1.8 meters in length for males with a maximum length of 2.29 meters. 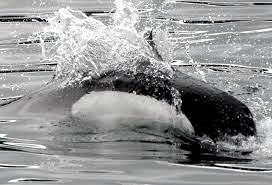 Females average 1.8 meters in length with a maximum length of 2.1 meters. 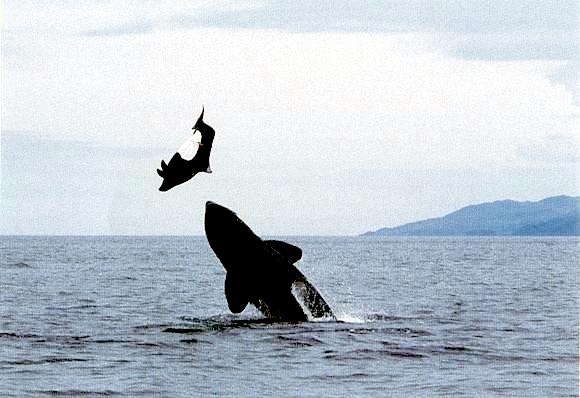 Their weight averages 123 kilograms for both males and females with a possible maximum weight of about 160 kilograms. 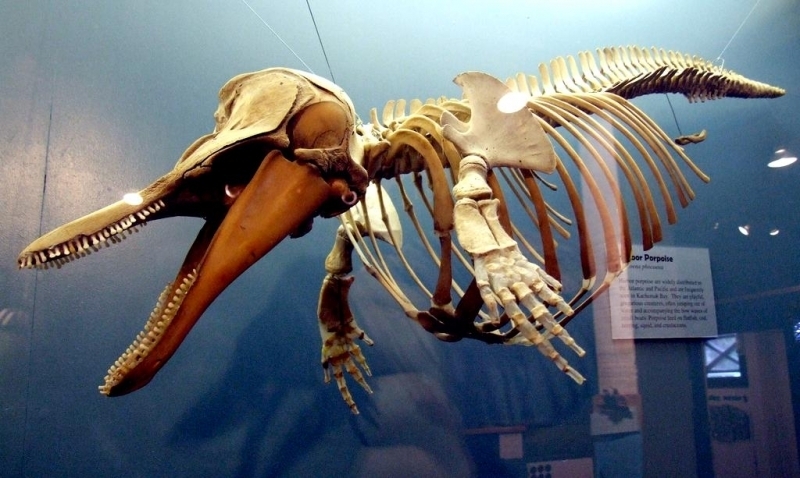 They have 19-23 small teeth in each side of their upper jaws and about 20-24 teeth in each side of their lower jaws, which extends beyond their upper jaw. 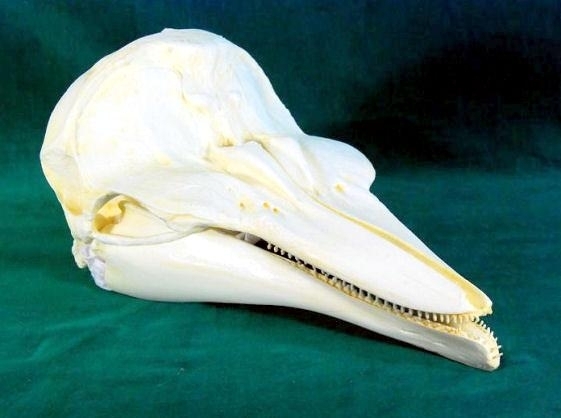 Each spade-shaped tooth is separated by rigid, protruding growths known as “gum teeth” thought to be used to aid the small teeth in grasping slippery prey such as squid. 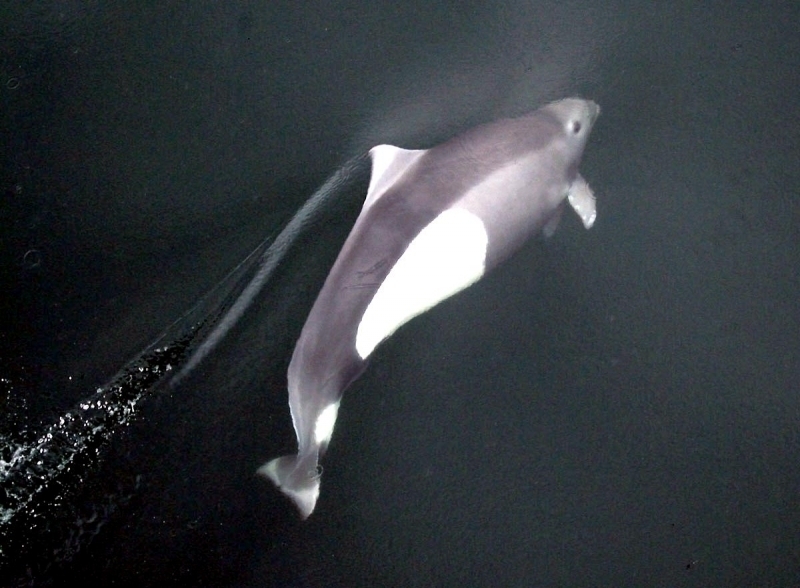 Dall’s Porpoises have a hump on their dorsal (upper) side and another hump, more prominent in males, found in front of their flukes (tails) on their ventral (under) sides. 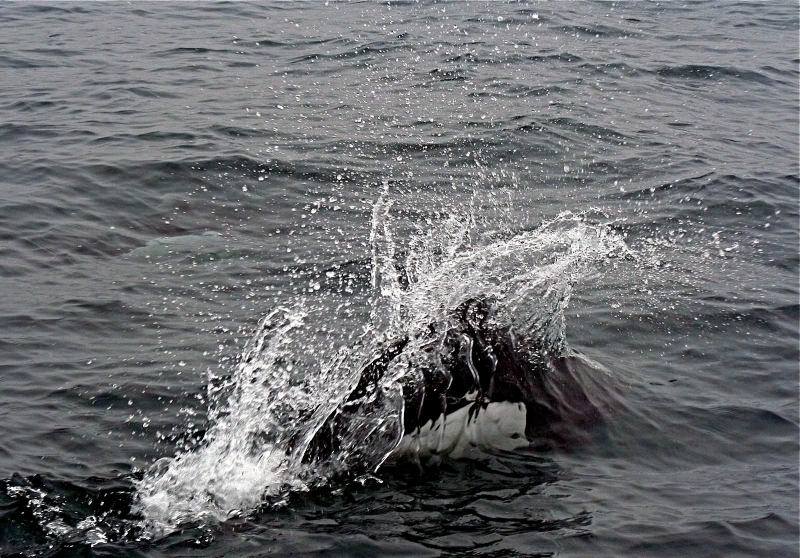 Their dorsal fins are located slightly forward of the center of their body and are triangular in shape. 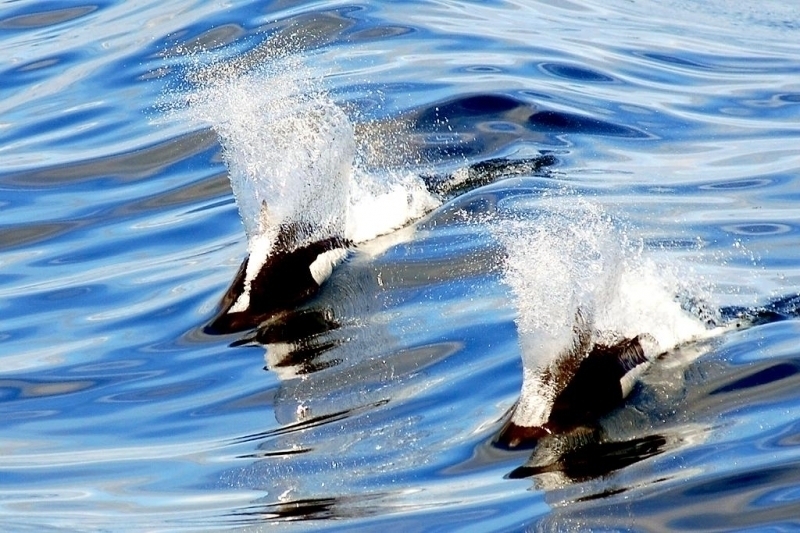 Their small flippers are rounded at their tips and their small flukes are pointed with a slight notch in the middle. 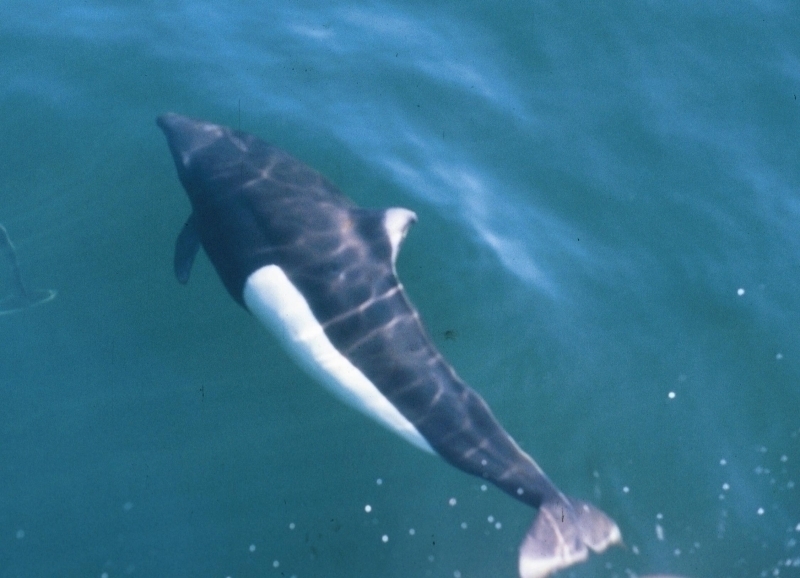 Dall’s Porpoise’s eyes have unique black or dark blue irises with deep, iridescent blue-green pupils. 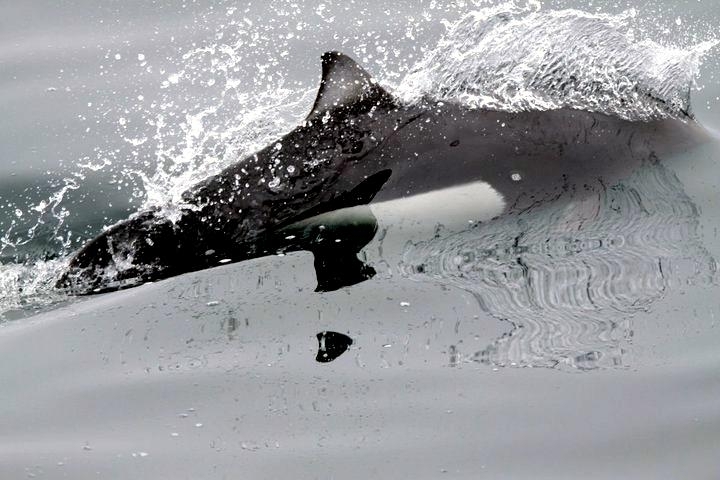 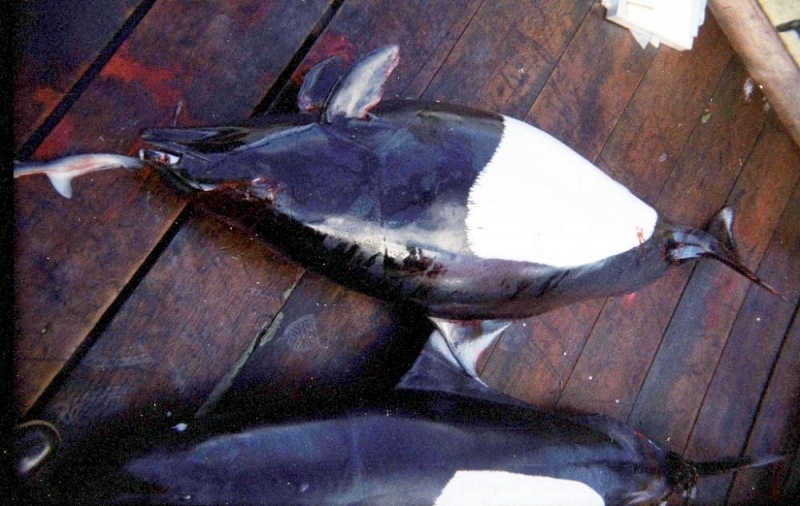 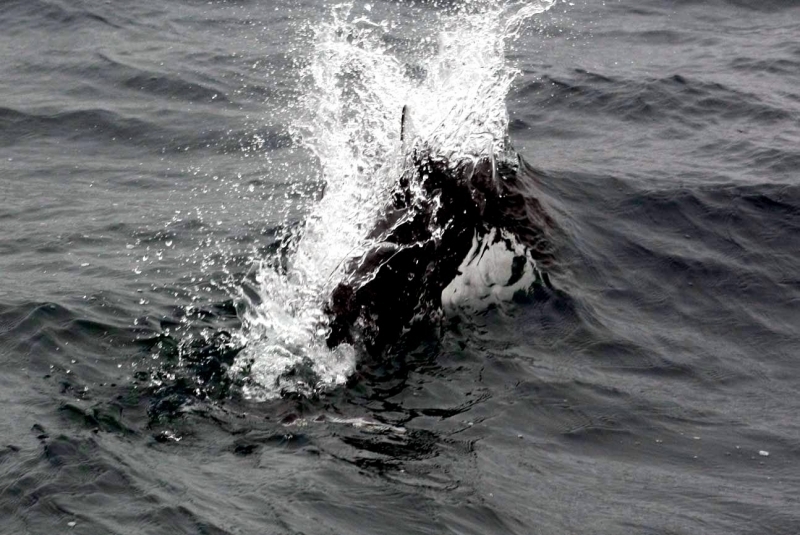 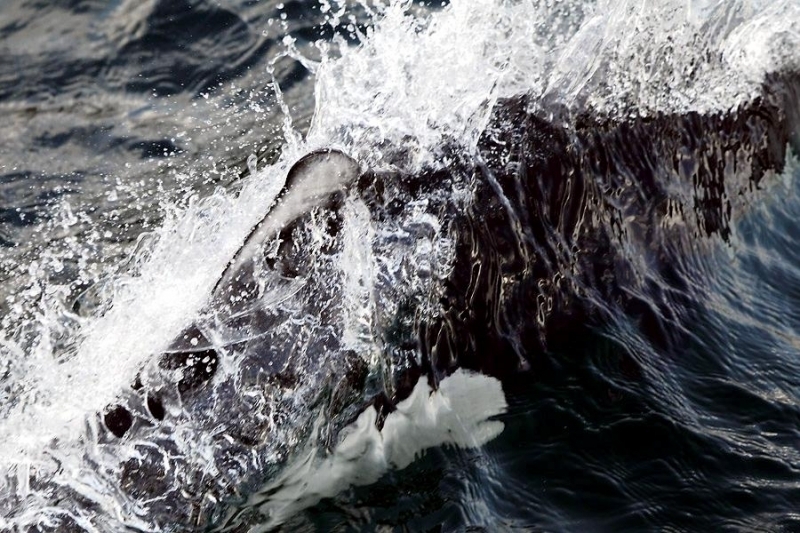 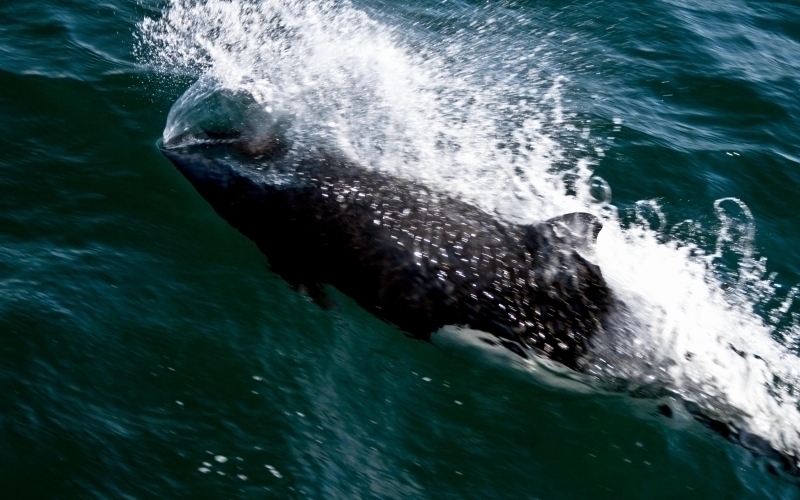 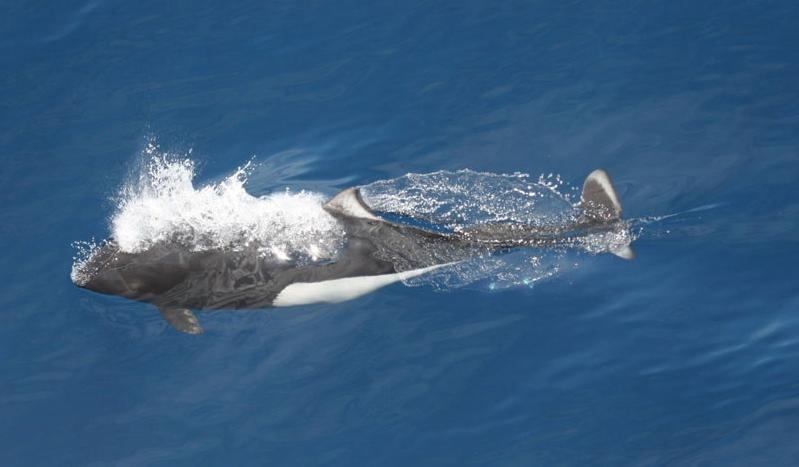 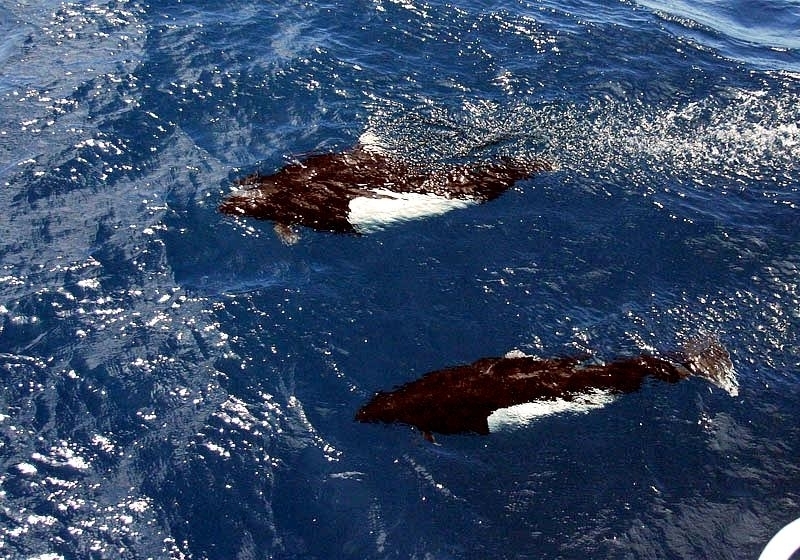 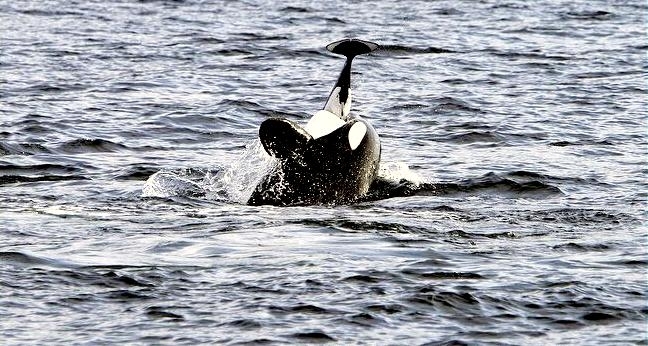 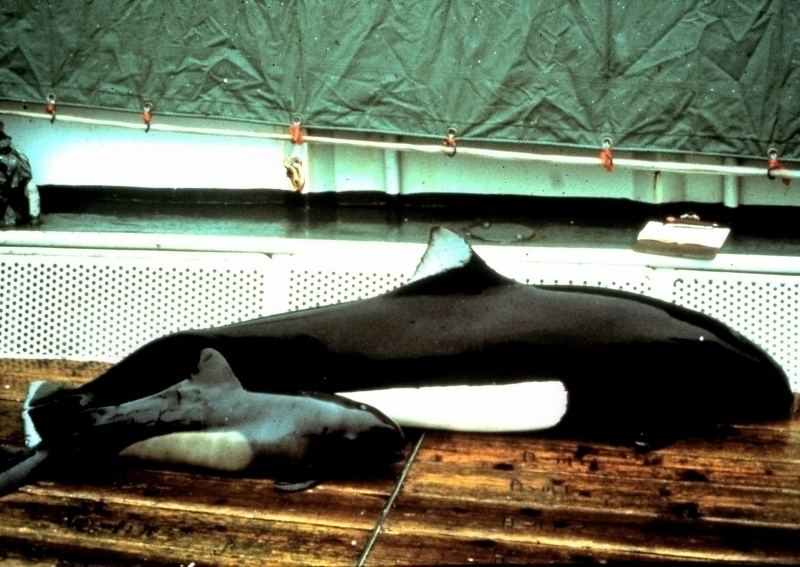 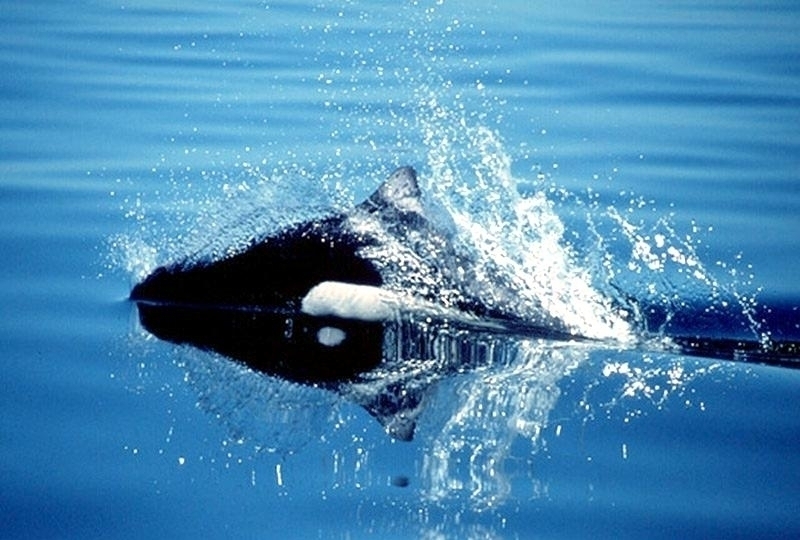 These cetaceans are black on their dorsal (upper) sides with oval-shaped white markings along their flanks and white on their ventral (under) sides. 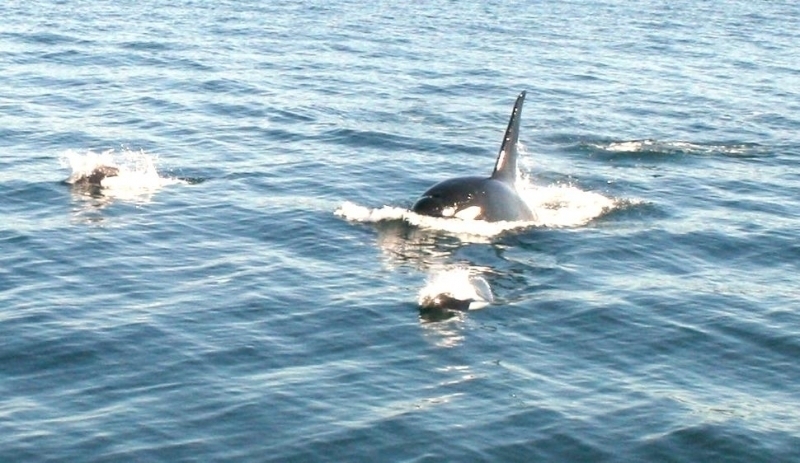 Their flukes (tails) are bordered by a band of white and their dorsal fins also have white markings of various shapes, although they can be solid black or white. 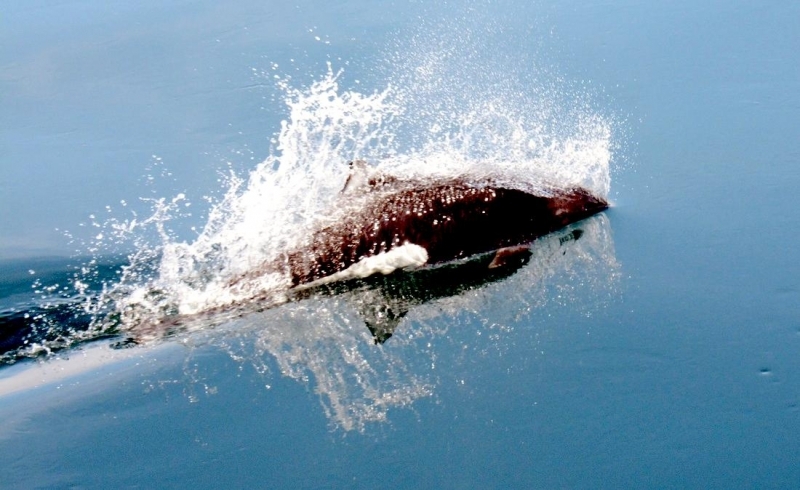 Dall’s Porpoises are extremely fast swimmers reaching speeds of up to 30 knots and are the fastest of all cetacean species. 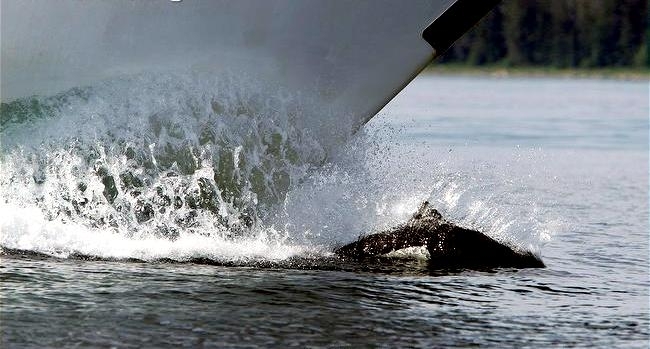 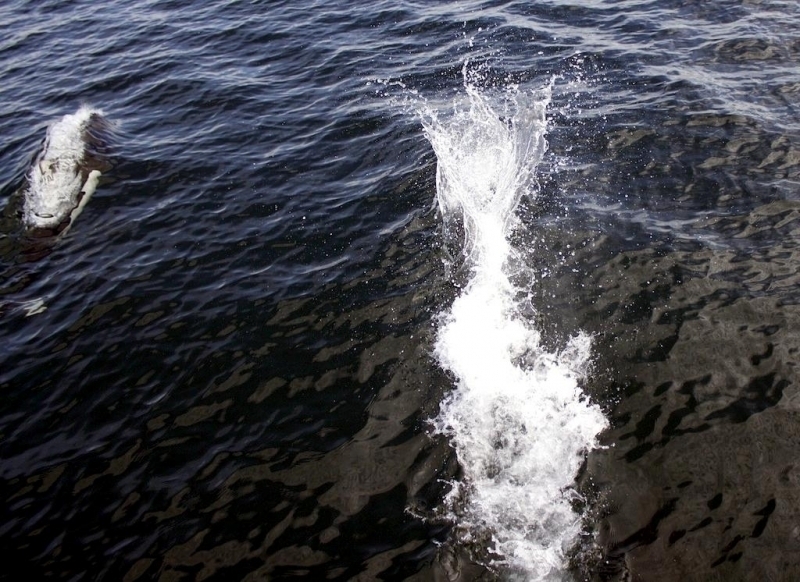 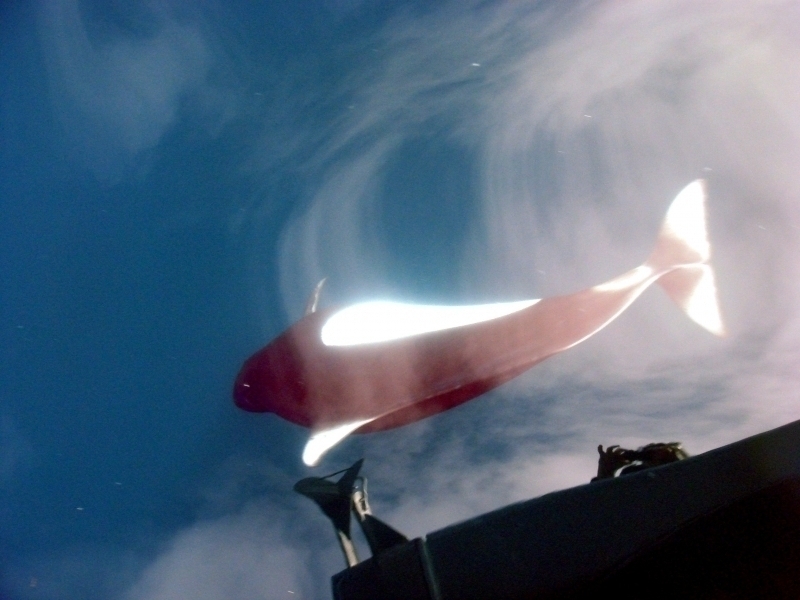 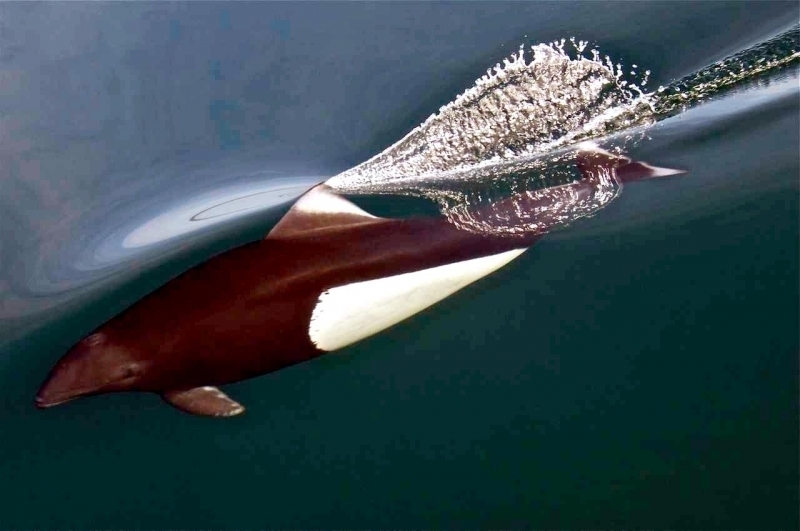 They enjoy the bow riding and they create a bow wave of their own known as a “rooster tail”, which creates a hollow airspace in the water that allows the Dall’s Porpoise to continue breathing while swimming. 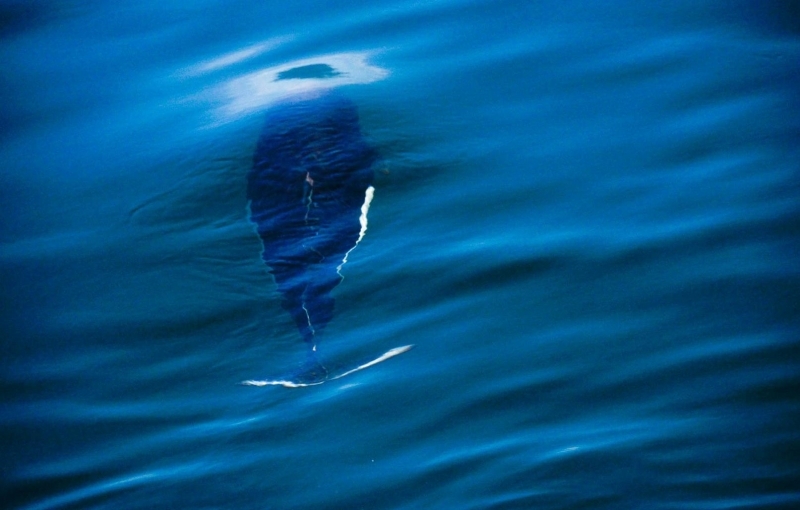 In spite of their tendency to bow ride, this species can also be elusive when it comes to human interaction. 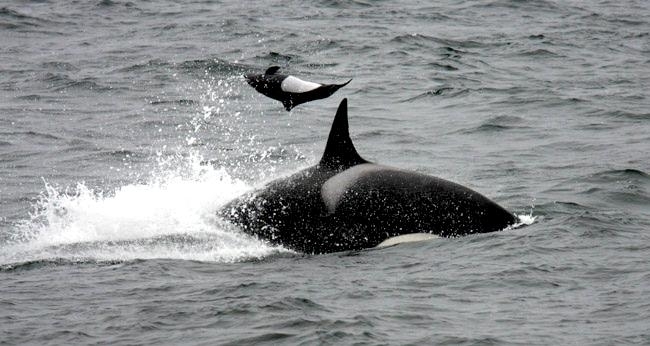 They are typically found in pods of 10-20 individuals, but pods of up to 200 have been observed feeding. 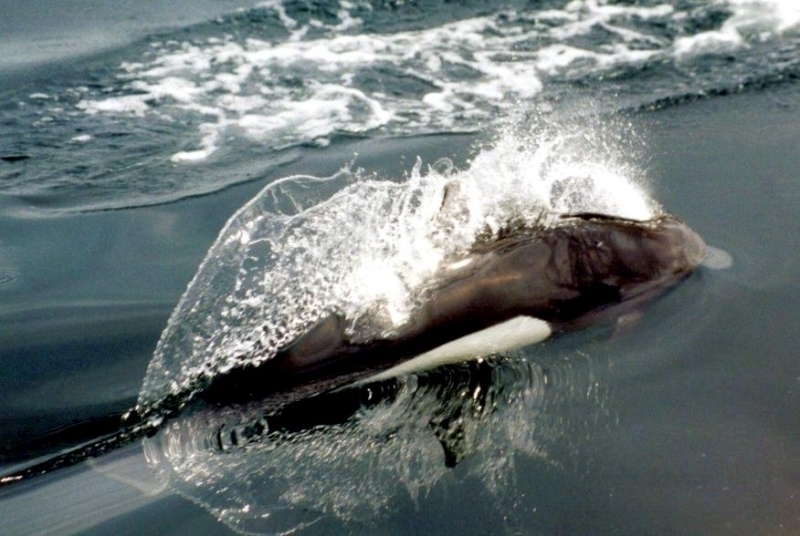 They often associate with Pacific White-sided Dolphins and Short & Long-finned Pilot Whales along with racing & playing occasionally with Killer Whales. 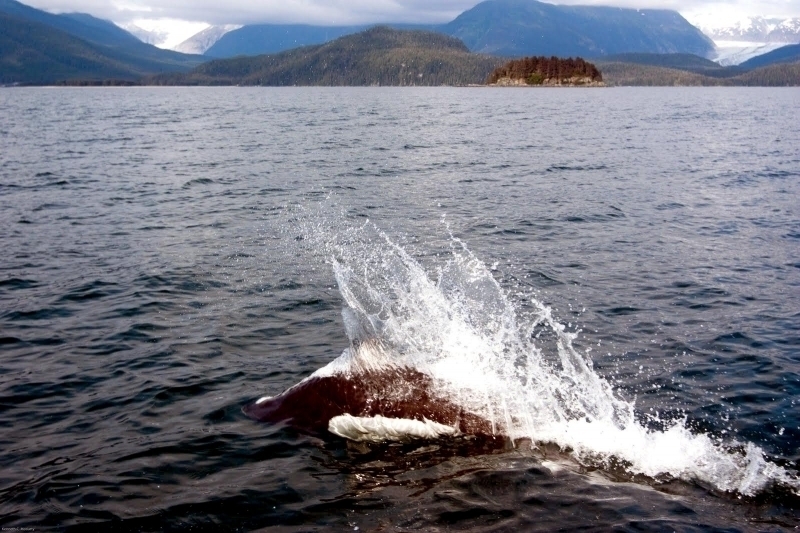 Dall’s Porpoises are limited to the North Pacific, ranging from Baja California north to Alaska and the Bering Sea and across into Japanese waters. 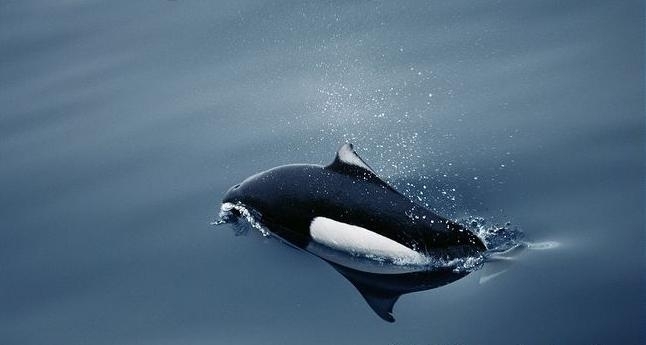 They tend to prefer colder waters with temperatures of less than 15 °C and are year-round residents throughout this range. 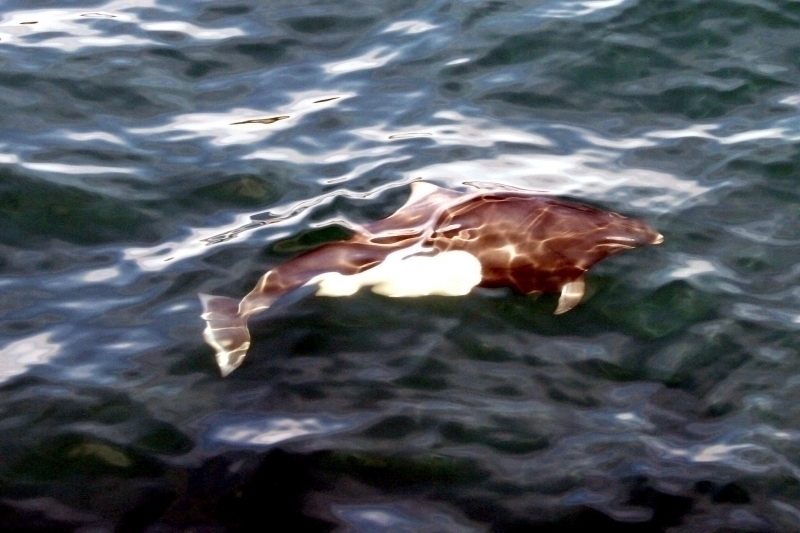 Dall’s Porpoises feed on squid in some parts of their range, but in other areas they feed on small schooling fishes such as capelin, herring and sardines. 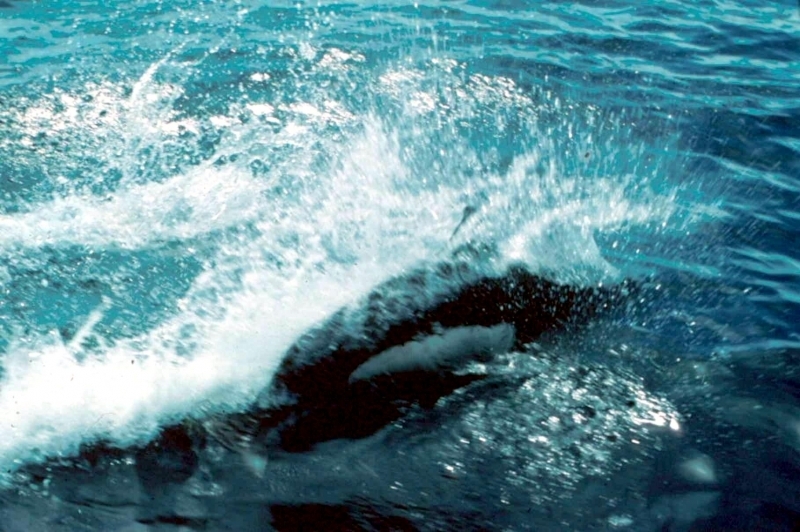 Deep-water species such as hake and deep-sea smelt are also prey of Dall’s in some areas. 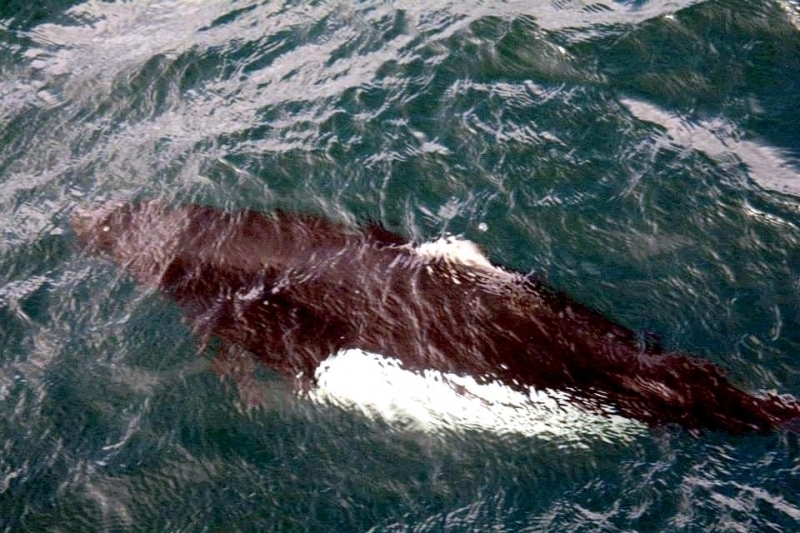 They are known to consume about 12.7-13.6 kilograms of food daily, primarily at night. 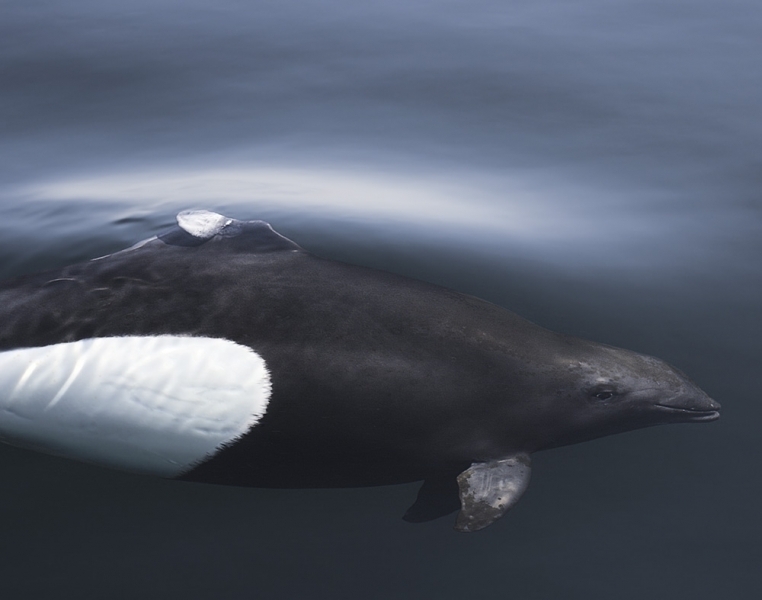 Dall’s Porpoises reach sexual maturity at about 1.9 meters or at 8 years of age for males and about 1.7 meters or 7 years for females. 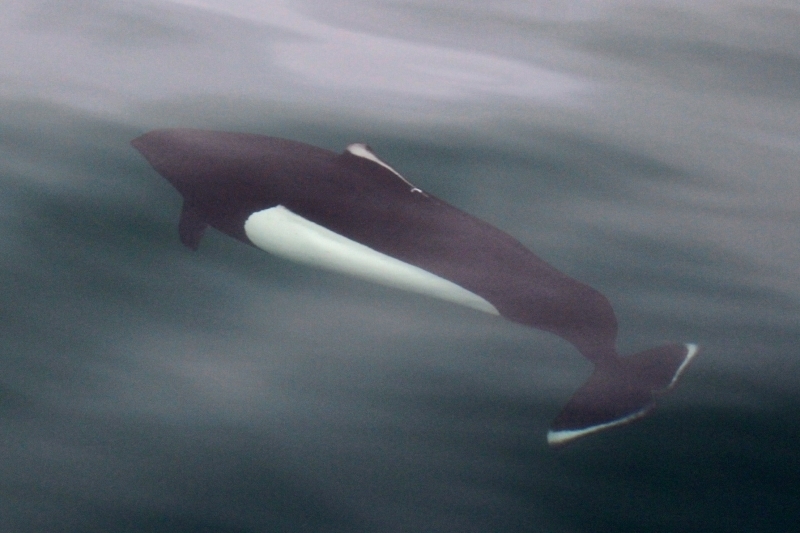 Calving takes place primarily in summer, although births in U.S. coastal populations occur year-round. 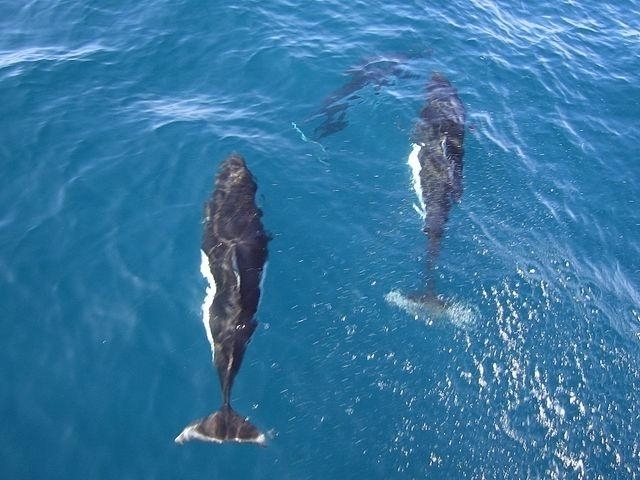 Gestation is between 10-12 months and calves are born averaging 1 meter in length and weighing about 25 kilograms. 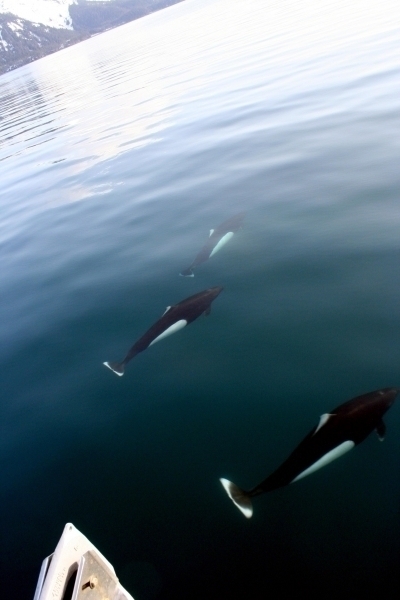 They are nursed for 2 years. 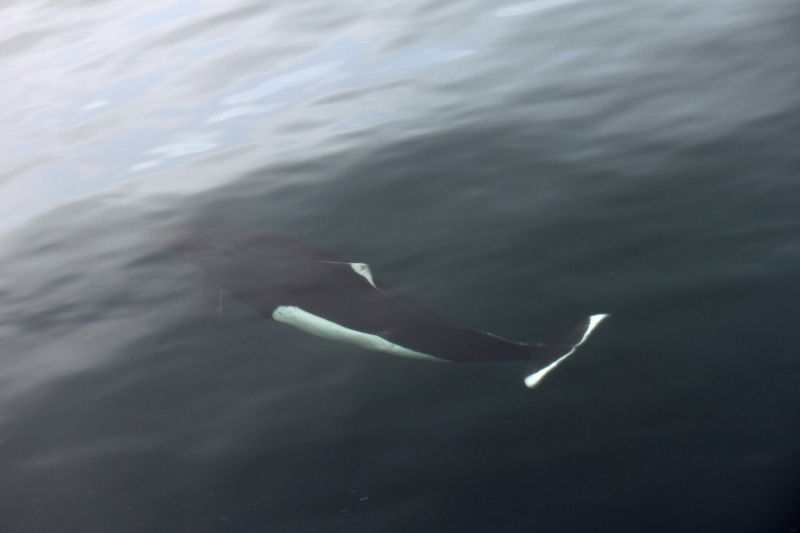 The calving interval for females is around 3 years. 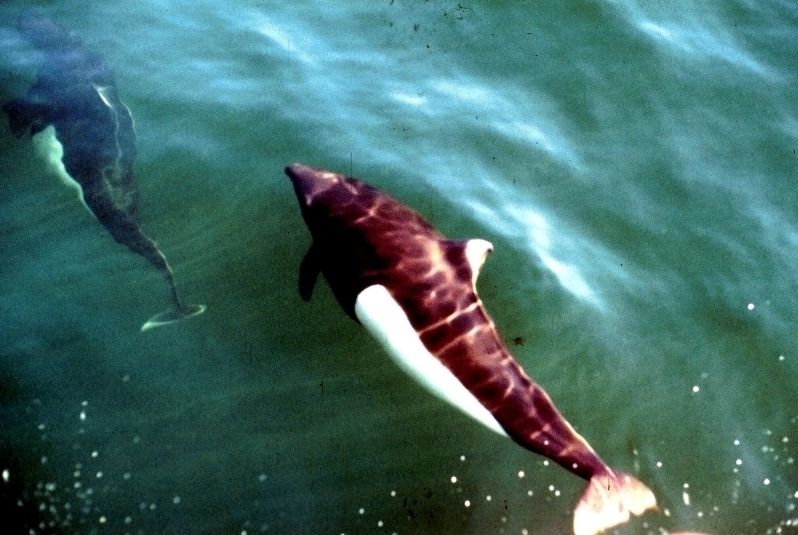 Life expectancy for Dall’s Porpoises is estimated to be less than 20 years. 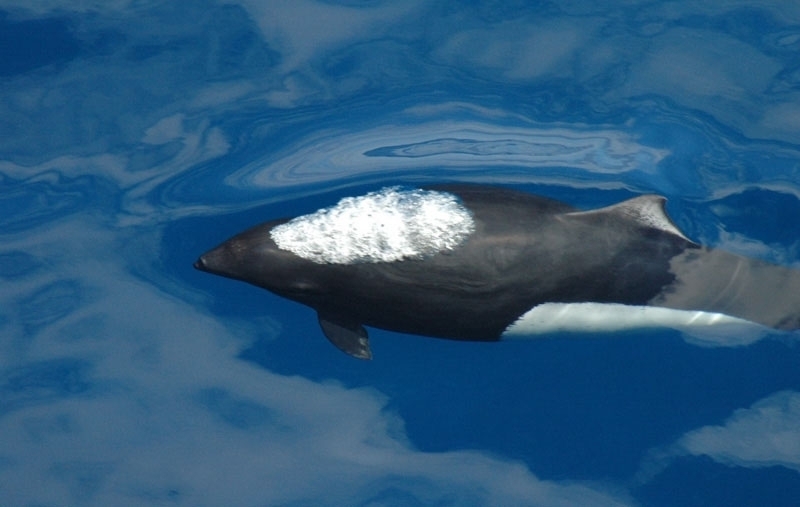 Dall’s are still abundant throughout their range; however in Japan, large numbers are caught in gill-net fisheries and coastal whaling operations. 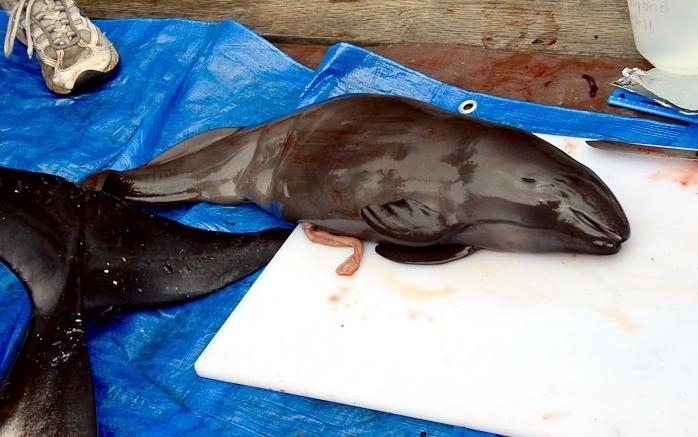 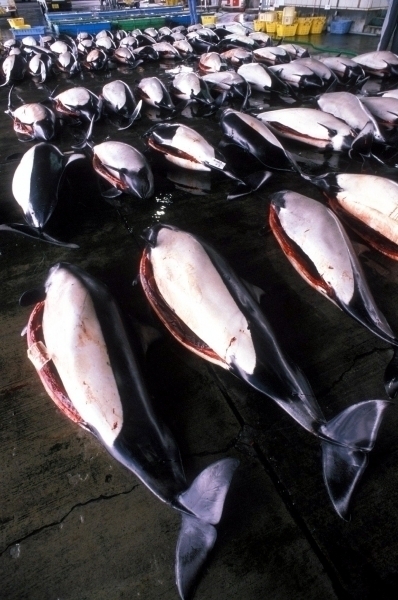 They are threatened by the Japanese high seas salmon fishery, where as many as 8,000-10,000 Dall’s Porpoises die as by-catch during the 2-month fishing season. 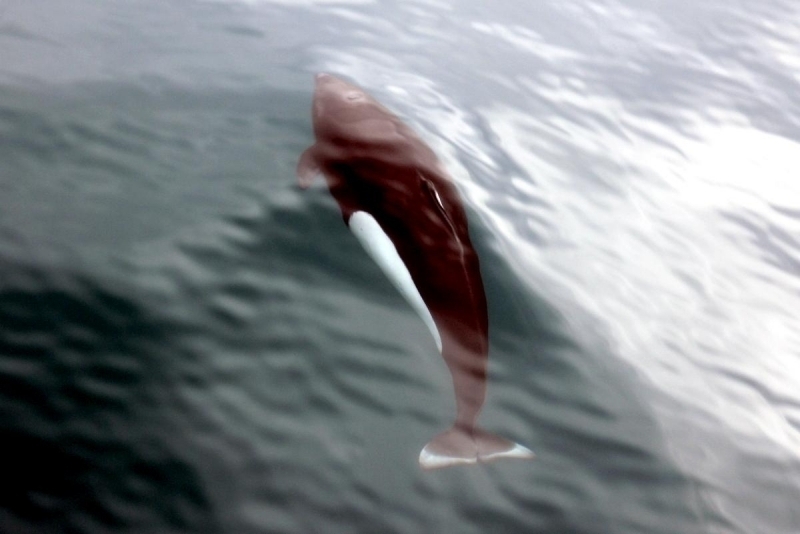 Although Dall’s Porpoises do not feed on salmon, it is thought that they become entangled while feeding on deep-sea species that come to the surface at night. 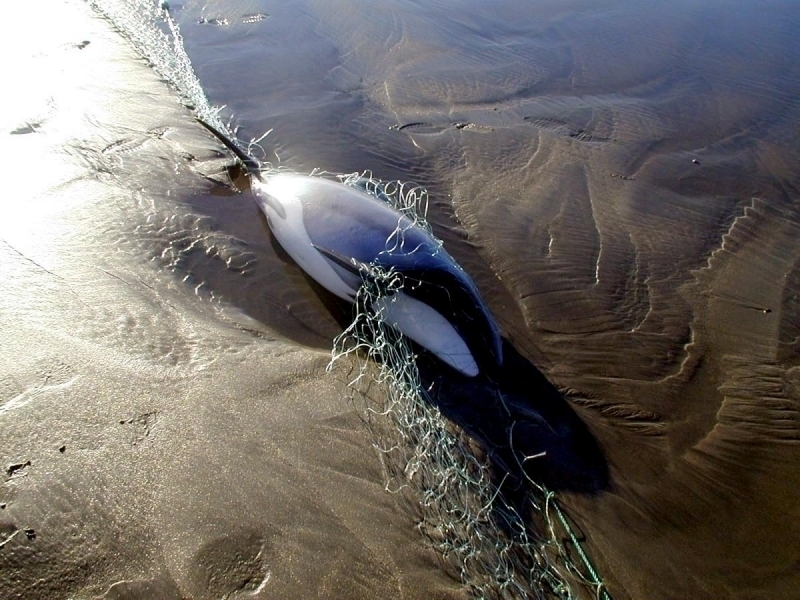 It has also been suggested that the plastic & nylon netting used in the salmon fisheries is not detected by Dall’s sonar. 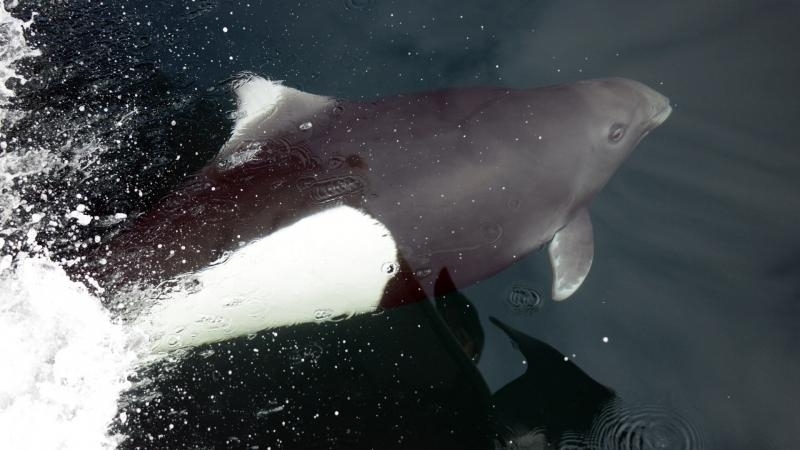 Unfortunately the majority caught are females, many of which are pregnant or nursing. 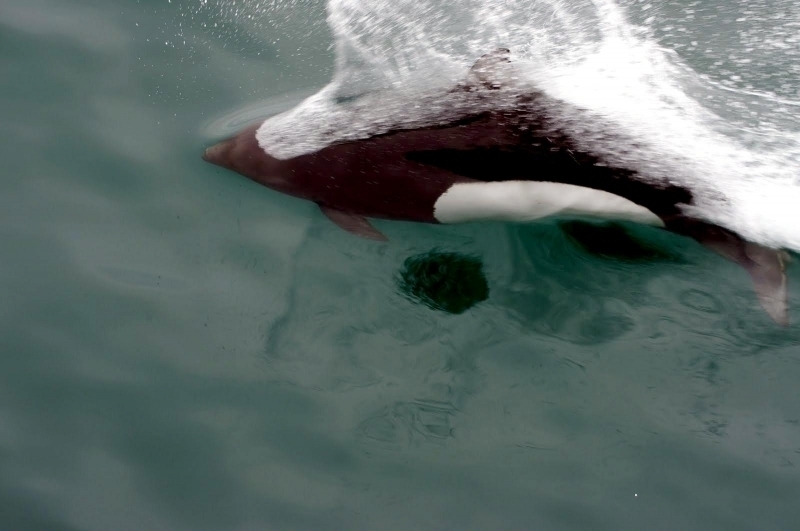 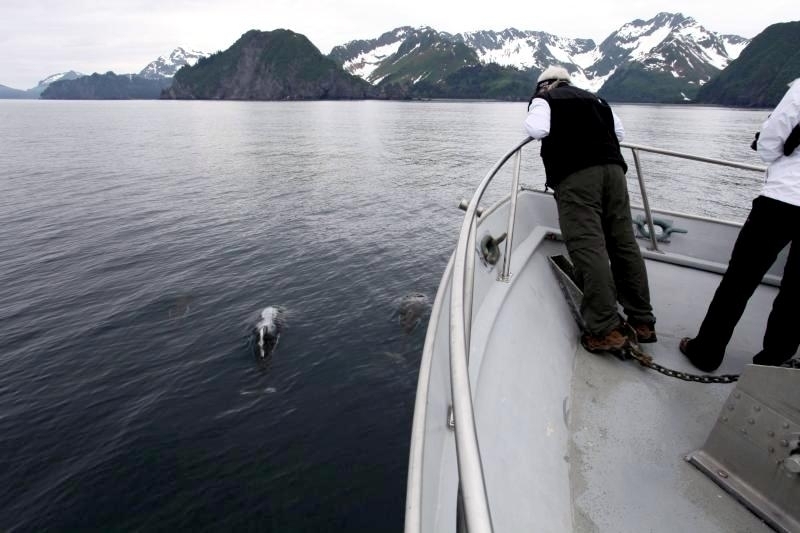 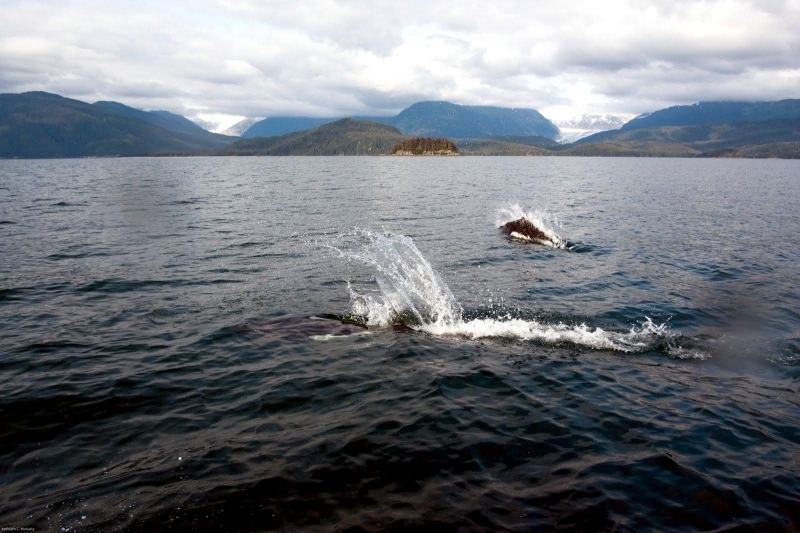 Efforts are underway to protect Dall’s Porpoises, an important endeavor given the extent of the fishing industry in their range.